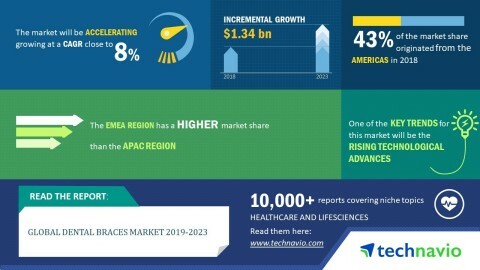 LONDON--(BUSINESS WIRE)--The global dental braces market is expected to post a CAGR close to 8% during the period 2019-2023, according to the latest market research report by Technavio. A key factor driving the growth of the market is the increasing number of dental practitioners in developed countries. Increase in the number of dental institutions and rising prevalence of dental disease in developed countries are giving rise to dental practitioners. In developing and underdeveloped countries, the number of dental practitioners is not many. The need for specialized dentists and orthodontists in the market is increasing owing to the growing prevalence of orthodontic disorders. Cosmetic dentistry is a growing trend in the market. This field is booming in the dental industry. Many people in developed countries are adopting cosmetic dentistry for aesthetics. This will increase orthodontic procedures which will propel the need for dental braces in the market. Consequently, the demand for dental braces will increase during the forecast period, in turn boosting the global market. As per Technavio, the rising technological advances will have a positive impact on the market and contribute to its growth significantly over the forecast period. This global dental braces market 2019-2023 research report also analyzes other important trends and market drivers that will affect market growth over 2019-2023. The increasing focus on the development of technologically advanced dental braces will augment their adoption. The advanced dental braces provide comfort and effective results with better appearance. Increasing change in technology is resulting in the development of such companies that can provide technologically advanced dental services and products. For instance, SureSmile a software by Dentsply Sirona provides a 3D impression of SureSmile Aligners. These aligners are made of advanced fabric through the 3D printing modeling with robotic laser trimming. These methods of product development facilitate proper fit and functioning of the braces. Therefore, technological advanced dental braces and software should propel market growth tremendously through the forecast period. “The rising prevalence rate of oral ailments and misalignment of teeth has increased the demand for oral care. People who suffer from oral health conditions such as orthodontic and periodontal conditions require immediate treatment and care. Orthodontic treatment is used to improve facial aesthetics in which dentists work on the alignment of the teeth. For many other dental problems such as dental caries, tooth discoloration, and gingival hyperplasia, regular dental check-ups are required. Therefore, the rise of such issues is expected to boost the growth of the overall global market,” says a senior analyst at Technavio. This market research report segments the global dental braces market by product (fixed dental braces and removable dental braces) and geographical regions (APAC, EMEA, and the Americas). The Americas led the market in 2018 with a market share of over 43%, followed by EMEA and APAC respectively. However, during the forecast period, the APAC region is expected to register the highest incremental growth of close to 2%. Technavio predicts the global dental braces market to post a CAGR close to 8% by 2023.